This year in our youth ministry, we’ve been inviting students to notice more. Notice the ant crawling through the grass. Notice the way we spend our time when it’s up to us. Notice the kid who ends up as the punch line of everyone’s jokes. Above it all, we’re inviting them to notice God—the way God is actively at work in and around us each day, the way God speaks through Scripture and through our community, the whispers in the silence, and the shouts from the dramatic sunset. It turns out that paying attention can make all the difference. In the midst of all that noticing, we’re inviting them into practices of faith. These practices, or disciplines, shape us largely because they open up space in our lives to notice—and make meaning of—God with us. The more we practice, the more we form patterns and rhythms in our lives that in turn allow the Holy Spirit to do the work of transformation. So when we pray, we become more aware of God and what God is doing. When we forgive someone, we notice that God is at work forgiving us too. Over the past decade of studying what helps young people develop faith that lasts at the Fuller Youth Institute, we’ve learned that regular faith practices are indeed important. Yet often teenagers aren’t sure how to nurture their own spiritual growth. FYI’s research has indicated that only about half of graduating youth group seniors pray once a day or read the Bible once a week. Beyond prayer and engaging Scripture, teenagers also don’t seem to have experience with a host of other faith practices that could make a difference in their day-to-day lives. The key is helping teenagers notice. Submerged in a world of distraction, there are more reasons than ever that young people find it difficult to practice disciplines that might have been important to our own growth. We might end up frustrated, cynical, or find ourselves resorting to shame-based tactics that end up leading young people to seek God’s—and our—approval through their practices. That kind of motivation misses the point altogether. This week marks the beginning of Lent with Ash Wednesday. You may or may not be used to practicing Lent as a congregation or a youth ministry, but this rich church tradition gives us some incredible leveraging points for deeper discipleship. And it’s about so much more than giving up chocolate. Because Lent is a set 40-day period in the church calendar leading up to Easter and is practiced across various traditions, you might want to harness Lent as an opportunity to engage students in new practices. Fasting is traditionally associated with Lent, but we may need to reframe fasting. I like to think of it as a practice of both “subtracting” and “adding.” In other words, fasting isn’t just about subtracting for the sake of subtraction. We subtract something so that we—or perhaps God—can add something new. What happens in the void left by whatever we choose to “give up” or abstain from? If we give up an hour of video games, what do we do with those extra 60 minutes? If we give up lattes, what do we do with that money? Maybe it’s adding silence and stillness to a life full of noise and movement. Maybe we add prayer when we’re usually silent toward God. Maybe God adds passion for serving the poor where we’re usually pretty self-absorbed. Subtract and add. Notice more. Jeff Shinabarger shares in More or Less stories of regular people who discover what this practice of subtraction can look like when it comes to deciding what is “enough.” How much food stored in our kitchen pantry is enough? How much technology, or time, or transportation options are enough? What would happen if we reimagine our excess—especially in light of the great need around us? This young woman started with the premise, “I am not my clothes.” When you think about it, that sounds a lot like Lenten practices. What would it look like to invite students to complete the sentence, “I am not my…” with something they don’t think they can live without (electronic devices, music, social media accounts, or perhaps fashion)? As a follow up to the initial Sticky Faith research, we took a year to explore the disciplines that best connect teenagers with God and nurture lasting faith, in particular those that help integrate faith practices with all of life. Out of that exploration we created a spiritual practice resource as an entry point for youth workers to invite students to create new, or deeper, faith rhythms. We call it Sticky Faith Every Day, and it’s available as a free download from our website. It’s an 8-week curriculum, but can be adapted however you’d like to fit your ministry. Several of the themes correspond well to themes of Lent, including a week focused toward the death of Jesus and a week focused on his resurrection. This week we have also pulled out a brief “Introduction to Lent” download you can use in your ministry whether or not you’re utilizing the rest of the curriculum. It’s designed as a take-home resource you can share with students to explain Ash Wednesday, Lent, and the idea of fasting as adding and subtracting. You may already have traditions surrounding Ash Wednesday, perhaps including a worship service and the giving and receiving of ashes. This guide does not attempt to create or overstep the foundations already laid for Ash Wednesday worship (you can find a lot of great resources online if you need more ideas). Instead, this guide could be used in a regular gathering or small group, or perhaps even as an introduction to a more traditional ceremony of ashes. Whatever else you do—or don’t do—this season, invite students to see it all as an opportunity to notice God more. 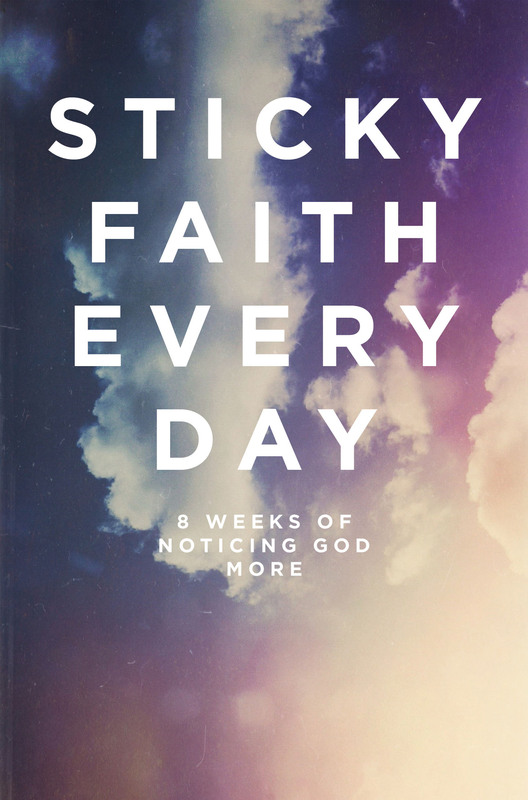 Want the entire 8-Week Sticky Faith Every Day Curriculum?